27 January 2015 – Thaipat Institute unveils the ESG100 list, naming the top 100 public listed companies that have demonstrated remarkable corporate sustainability. Only 100 out of 567 companies on the Thai stock market have entered this list, but together their market capitalization is well over Bt9 trillion. The list includes 12 companies from the energy sector, 10 from the banking sector, and just four from the Market for Alternative Investment (MAI). 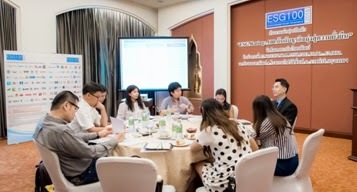 The ESG Rating Unit of Thaipat Institute, who pioneers in the development of Thailand’s corporate sustainability database, now releases the ESG100. This list names the top 100 public listed companies that have outstanding Environmental, Social and Governance (ESG) performance. In compiling this list, Thaipat Institute has assessed 567 public listed companies based on more than 10,500 data points of publicly-disclosed ESG information from six data sources1. The ESG100 companies have the combined market capitalization at around Bt9 trillion. In other words, their market capitalization accounts for 64 per cent of the Thai stock market’s total market capitalization of Bt14 trillion. The director of Thaipat Institute says of all business sectors, the energy & utilities sector has the highest representation on the ESG100. As many as 12 energy/utilities companies are on the list. Coming next is the banking sector, with 10 companies from the field entering the ESG100 list. Four companies from the MAI have also made it into the list. They are QTC, ILINK, CMO, and APCO. Released by the ESG Rating Unit of Thaipat Institute, the ESG100 list opens up a new dimension of public companies’ ESG-information disclosure. Investors thus will be able to incorporate ESG factors, together with financial information of available listed companies, into their investment’s decisions. Such practice, in turn, will allow them to not just enjoy returns on investments but also to promote good corporate governance, corporate social responsibility and environmental responsibilities among public listed companies. Internationally, several agencies have compiled corporate sustainability rankings based on ESG information and released them to investors. Among these agencies are S&P Dow Jones, FTSE, and MSCI. The number of such agencies also keeps growing, given that sustainable investments have been soaring significantly worldwide. In the United States alone, sustainable investments totaled 6.57 trillion US dollar2 in 2014. The amount accounted for 18% of the $36.8 trillion in total assets under management tracked by Cerulli Associates. Simply put, more than one out of every six dollars under professional management in the United States is involved in investments takes into account ESG information. In Europe, the sustainable investments stood at about 7 trillion Euro3. “The ESG100 provides baseline data for investors who are looking for listed companies with outstanding environmental, social and governance. These firms offer sustainable investments. Returns from such investments are also no less than those from traditional investments” Dr. Pipat says. The full list of ESG100 companies is freely available at www.esgrating.com. 1 These sources are: Data listed under the Corporate Social Responsibility subject in the annual registration statement (Form 56-1), the Securities and Exchange Commission; Data compiled from the result of Corporate Social Responsibility Awards and CSRI Recognition Awards, the Stock Exchange of Thailand; Data used for the granting of Sustainability Report Awards, the Thai Listed Companies Association; Findings from CG Scoring surveys, the Thai Institute of Directors (IOD); Findings from sustainability development ratings on CSR Progress Indicators and Anti-corruption Indicators, Thaipat Institute; and information on Thailand’s public listed companies that are included on Dow Jones Sustainability Indices (DJSI). 2 US SIF, Report on Sustainable and Responsible Investing Trends in the United States, 2014. 3 EUROSIF, European SRI Study, 2014.